Against the pound, it dropped by 0.1%. The central bank said rates would remain at their present levels "at least through the end of 2019" rather than its previous guidance of "at least through the summer". 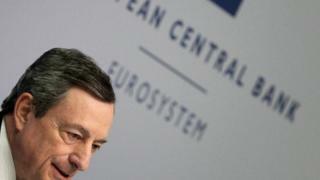 Mario Draghi, president of the ECB, said economic data showed a "sizeable moderation" in growth. He said economic growth in the euro area was now expected to be 1.1% this year, as against a previous forecast of 1.7%. Inflation is expected to be 1.2%, down from an earlier forecast of 1.6%. "We are [in] a period of continued weakness and pervasive uncertainty. The near-term growth outlook will be weaker than previously anticipated," Mr Draghi said. The extent of the measures announced by the ECB underline its concerns over slowing growth in the eurozone. Its decision to push back on any plans to raise rates anytime soon follows similar moves from central banks around the world, including the US Federal Reserve and the Bank of England. Not the really big guns, at least at this stage. No cut in interest rates (they are so low already that that might not be realistic anyway) and no revival of quantitative easing. But the bank is using two tools that do suggest it is becoming more concerned. One is known as forward guidance, an indication of the likely path of interest rates in the future. They are currently rock bottom and the Bank now says said they are likely to stay that way until the end of the year. The ECB has also announced plans for a new round of what are known as targeted long-term refinancing operations or TLTRO. If you are still conscious after reading that, these are loans made to commercial banks intended to stimulate more lending to households and business. They are also intended to - as the ECB statement puts it - ensure the smooth transmission of monetary policy. Which means spreading the effect of the low interest rates throughout the eurozone economy. As well as a slowdown in the eurozone - Italy tipped into recession at the end of last year - Mr Draghi also pointed to the impact of trade wars and other factors. "The risks surrounding the euro area growth outlook are still tilted to the downside, on account of the persistence of uncertainties related to geopolitical factors, the threat of protectionism and vulnerabilities in the emerging markets," Mr Draghi said. The new lending facility for the banking sector will be known as Targeted Longer-Term Refinancing Operations. Andrew Kenningham, chief Europe economist at Capital Economics, said the guidance on the next rate rise and the financing for banks was "more accommodative than the markets had anticipated". "We doubt, however, that the new measures will be enough to reverse the economic slowdown," he said.